If you’re looking for some seriously big bites, Oklahoma has it. From pizzerias, to burger bars, to diners, you’ll find enormous meals to test your stomach. In the mood for a two-pound burger? We’ve got it. How about a six-pound pizza? Got that too. Check out the best places for BIG food in Oklahoma. If you eat the entirety of the giant meal in the allotted time, it just might be taken off your bill! The Empire pizza is 20 inches of deliciousness. For the Empire Challenge, you choose three toppings, which are doubled on the pizza to make a six-pound pie. If you can finish it in 45 minutes, the pizza is free, and you get a t-shirt. To date, only one man has succeeded. This legendary restaurant has a Jumbo Big Ed Burger made with three pounds of beef and includes a double order of French fries. It’s said to serve up to eight people. Took Thing 1 and her mini to Big Ed's. Had to get the Big Ed burger! Get a five-pound burrito smothered in a habanero sauce and served with rice, beans and a sopapilla. If you can eat it all in 30 minutes, you get it free! Get ready for the Fat Guy’s Burger Bar Challenge: a two-pound patty, 15 slices of bacon, two hot dogs, eight slices of cheese, and vegetables placed on a one-pound bun. It’s served with a pound of French fries in a 60-minute challenge to clean your plate. At the Cow-Calf Hay, they have a Six Shooter Challenge which includes a six-patty cheeseburger, each patty is a half-pound, and it’s made with 12 pieces of American cheese and dressed to order. It also has a full order of onion rings, a full order of curly fries, and a piece of Cow Pie Cake, plus your drink. Finish it in 45 minutes for recognition and a t-shirt. A little different from last time with the change in dessert, but still a tasty challenge. First time it was a brownie with ice cream on top, and this time was with a cookie (that was dry, and hard). The only change I would request is that the cookie be microwaved. The Big Nasty includes six Nathan’s Famous jalapeno cheese dogs, 14 ounces of fries, and a 16-ounce shake. This enormous challenge is certainly not for those with a small stomach! This historic restaurant is home to the “Best Burger in Oklahoma.” It’s been serving them up since 1901. The Seismic Meersburger is a one-pound patty topped with jalapeno peppers, bacon, cheese, sweet relish, mustard, dill pickles, purple onions, tomatoes, and leaf lettuce. There’s no challenge with the burger. 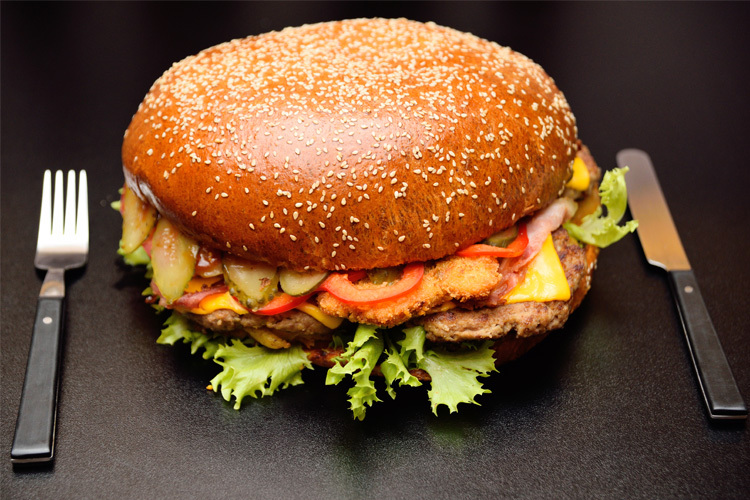 It’s just a huge portion of the famous and delicious Meersburger! This restaurant features a huge Chicken Fry Challenge. You get a salad, chicken fried steak, mashed potatoes or fries, green beans, biscuit, and cinnamon roll. It costs $25, but if you can eat it within an hour, you get your meal free. This café inside the casino features a Brutus Burger Challenge which is a two-pound burger, served on a grilled bun with lettuce, 12 tomato slices, 12 slices of American cheese, 12 strips of bacon, a whole dill pickle, two pounds of French fries, and a milk shake.